Summer is all but over and fall is just around the corner. Autumn colors, hot apple cider and cozy bonfires are certainly reasons to anticipate the season. However, autumn also indicates the arrival of falling leaves, shifting temperatures and fierce winds, which can really test the durability of your home’s exterior. The key to a happy, healthy and cost efficient home during the colder months is seasonal home maintenance. 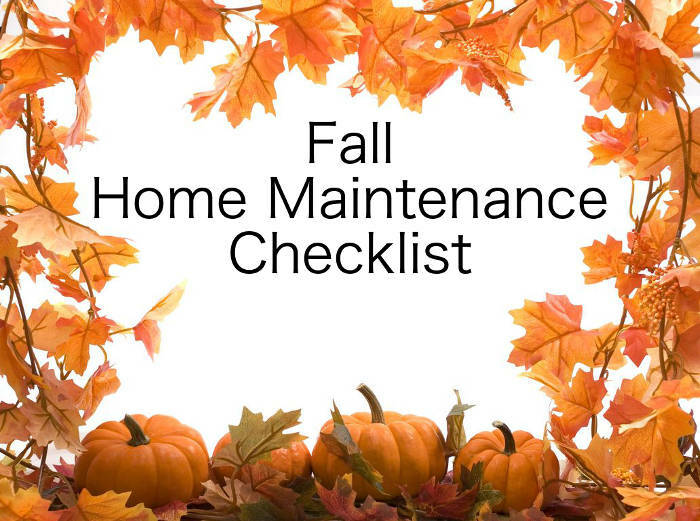 Here is a list of preventative maintenance tasks for your home in Lexington, KY that you should complete each fall. For your convenience, you can download or print the checklist. The roof is one of the most vulnerable areas of your home. Perhaps more than any other area of the home, it is constantly assailed by the elements. You should monitor the condition of your roof every fall to prepare for harsh winter storms. This will ensure that it can perform under all conditions. Items to consider checking include the flashing and loose or missing shingles. You may also want to make sure that you don’t have any type of debris build up or algae/lichens growing on your shingles as this can also lead to additional issues. Making sure that your gutters are clean and free of clogs and other debris will ensure they operate as intended. If they are not, it could easily spell trouble in the future. Things to look for include clogs, miscellaneous debris, cracks, dents, rust spots and fittings that seem disconnected or loose. Check for any signs of leaks in your gutters during a rainy day. Siding is another extremely important feature of your home. Like the roof, it is constantly at the mercy of the elements. Damaged siding subjects your interior walls to water damage, potentially leading to costly repairs in the long run. Signs to look for include loose, missing, cracked, bent or warped siding. One of the largest causes for increased heating costs during the fall and winter is air leaks. These often occur around windows and door frames. Areas of weakness to look for include checking the caulking, weather stripping and seals for gaps or missing material. You may also want to check for water damage around your windows and door frames, as well as window sills. This moisture around the frames can lead to rot, which attracts pests and mold. Save on your heating costs by identifying and promptly sealing these pesky leaks. This way, you can have more money for enjoying the holidays! On a colder day, turn the heat on, go outside and use the back of your hand to feel for warmer air escaping your home’s windows. This will be an obvious sign that your windows are costing you more money than necessary. Check ceilings for signs of water damage. Water spots on your ceiling are often very subtle and unless you’re trained to identify it, they can be hard to detect. Usually these spots begin as small as a dime and start out as a slight discoloration in your ceiling’s paint. This discoloration in any form is likely a sign of a leaky or faulty roof. Ensure attics and crawlspaces are properly sealed so they stay cold during the winter. A warm attic could cause ice and snow to melt on the roof, eventually leading to ice dams, which cause damage to your home’s gutters and siding. A sign to look for includes water logged areas near the rafters in your attic. These areas will typically be darker discolored areas in your wood. Windows should also be inspected on the inside as well. One of the more common issues you might notice are signs of moisture in your windows. This may be a result of poor insulation within your windows. When warm air and cold temperatures collide, it causes this type of condensation. This is an indication of a faulty seal or a result of a window that is not double-paned. You should also test them by opening and closing your windows. If they do not operate smoothly, this may be an indication that you could have problems with your foundation or an improperly installed window. If it’s cold outside, use the back of your hand to detect cold air penetrating your home. This is a simple and easy method to detect your window’s current performance. Alternatively, on a windy day, hold a feather or thin piece of paper near the suspected leak to see if the draft catches it. It’s important to also check your doors on the inside as well. Look for proper alignment by identifying cracks or gaps within the door frame. Just like your windows, use the back of your hand on a colder day to feel for cold air penetration. Another option to consider is while you’re on the inside of your home, turn off the lights in your home and have someone else (at night when it’s dark) go outside and use a flashlight around all edges of your door. If you see light penetrating your home between the door and its frame, this is a sign that improvements can be made to lower your energy bill expenses. If you happen to have any type of home warranty, you’ll want to first and foremost, check your manufacturer’s warranty to understand which repairs are covered and what actions to avoid. Certain home maintenance tasks, like treating algae, for example, may seem harmless, but doing so could easily void your warranty and cost even more money in the long run. When in doubt, always contact a professional. Make sure you clean your chimney. Colder weather means more fireplace usage and a clogged chimney could spell disaster for your home. If you’re not a DIY expert, you may appreciate our services. At Lexington Blue, we provide just about all types of home inspection services that are at no cost to you! As always, we offer non-biased advice on steps you can take to keep your home operating at optimal performance. By ensuring that your home is in top working condition, you’ll enable it to carry out its purpose by protecting your home from the harsh weather of the colder months. This leaves you more time to focus on hot chocolate, apple pie and carving pumpkins. Call or Request Free Inspection!